Availability: November through July - sporadic. Handling Tips: 45-50�F. Keep cool and dry. 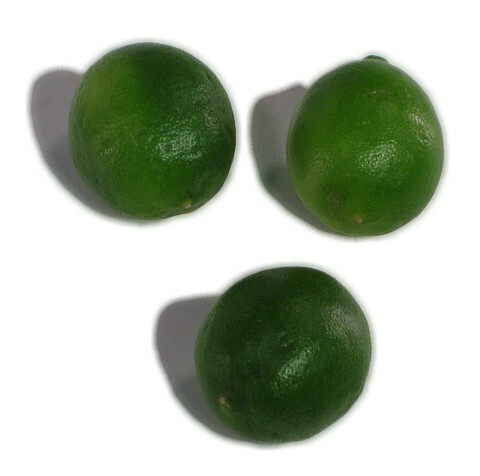 General Information: A rather cute tiny oval fruit, the shiny greenish-yellow limequat wears a thin sweet-tasting skin. This dainty pretty little fruit is a result of crossing a lime with a hardy kumquat. Its pulp is bitter-sweet and contains small edible seeds. Limequats grow on open twiggy-looking trees. Originating in China, this plant is now grown in Japan, Israel, Spain, Malaysia, the United Kingdom and the United States in California and Florida. The fruit can be found, in small quantities, during the fall and winter months in the United States. There are three different varieties of this fruit, Lakeland, Eustis, and Tavares, with Eustis being the most common. Nutritional: Limequat are rich in vitamin C. Eating five daily servings of fruits and vegetables lowers the chances of cancer. A recent study found that eating nine or ten daily servings of fruits and vegetables, combined with three servings of low-fat dairy products, were effective in lowering blood pressure. Applications: Whole or sliced, this fruit can be eaten out of hand. These versatile fruits can be substituted for limes and lemons, for other tart juices, and made into marmalade. Limequats are excellent preserved in syrup or brandy and make delicious tangy pickles. Delicious relishes for meat and poultry can be made from the limequat and are superb dipped in caramel. Sliced, they make an attractive edible garnish for desserts. Citrus adds a refreshing zest to breads and salads, soups, and gives a sophisticated flair to relishes and vegetables. Citrus can coax hidden flavors from sauces and meats, and complements delicate seafood and fowl, makes elegant desserts, and embraces cocktails and coolers Topping it all, sculpted garnishes from citrus transform ordinary dishes to one step beyond.